A few months ago I was delighted to be asked to do some styling and photography for a new contemporary furniture company British Design Shop ahead of their launch earlier this year. Their pieces are all made here in the UK by skilled craftsmen and women using carefully selected materials and traditional methods, and they don’t sell through high street retailers - instead their business model is focused on offering beautifully designed and made furniture direct to the customer at reasonable prices. Both here on Design Hunter and when it comes to choosing things for our own home, I’m always drawn to considered pieces that stand stand the test of time, and when I was first contacted by British Design Shop’s founder and Director Nick Powell about working with them I really liked the designs he showed me and was interested in the company’s philosophy. 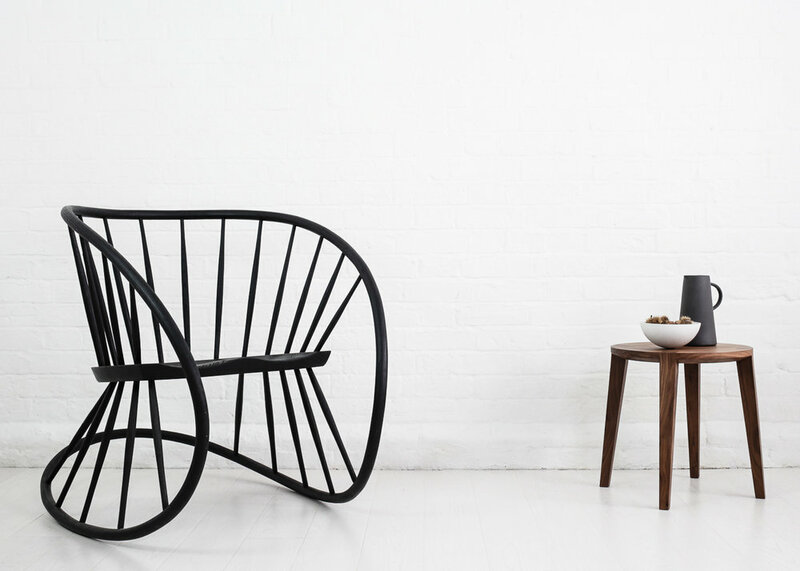 Their first collection, which they presented at Decorex in September, includes voluptuous cocooning sofas alongside contemporary Windsor style chairs and simple, pared back side tables with beautiful end grain joint details. There’s also a range of elegant bar stools, which like the other wooden pieces, are available in a wide range of different finishes. I’m placing a set of these on my wish list for our new kitchen extension next year. I’ve been meaning to share the work I did for them here on the blog for ages, so in today’s post I’m chatting to Nick about his vision for the company and how it came about. Tell us about British Design Shop and how it came about. Throughout my working life I've been involved in developing products and brands for major global companies. This experience over the last 15 years has connected me with leading product designers, eCommerce specialists and furniture manufacturers. Fundamentally, I wanted to start a furniture company in Britain that didn't involve importing furniture in bulk on the back of low cost labour. I wanted to go against the grain, promoting and supporting local quality craftsmanship and modern British furniture design, whilst offering a competitive price point for our customers. I proposed the business idea to three other British based business partners (a maker, a designer, an eCommerce specialist) and together we formed the business. Our products are 100% made in Great Britain. Our wooden product is made in Coventry and our upholstery comes from Nottingham. Which three words best describe your products and design ethos. What makes a piece of furniture a design that will stand the test of time? It has a timeless quality in form, material selection and detailing. Nothing is superfluous. You can enjoy the piece in the same way on the first day it arrives or many years after purchasing it. Where do you see your furniture belonging? Britain has some beautiful period properties and contemporary homes that have a fresh or refreshed, modern yet comfortable feel. These are the homes we are designing our products to live in. What’s next for British Design Shop? 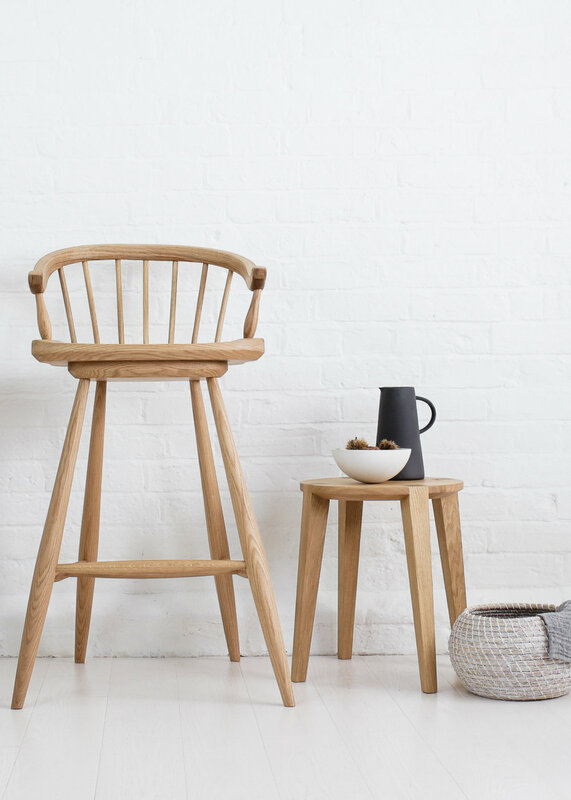 We have developed a broad range of wooden products from our factory in Coventry, such as our contemporary bar stool stock items or our modern Windsor chairs. Behind the scenes we are currently expanding our upholstery collections and will bring a number of new collections to the market for spring 2019. Being committed to buying all our products in Great Britain means it takes a bit more time to source all the detailed components for each collection, but we are determined to develop in this way so that we remain true to what we are trying to do. Styling and photography by Helen Powell for British Design Shop.